Just as the winter doldrums are about to set in, the NFL gives us a great reason to party: The Super Bowl. It's a hoot to host a Super Bowl party for kids because it's a casual event, the entertainment is provided, and the food is usually delicious. Wondering how to make football parties fun for kids? These ideas will ensure everyone enjoys the game. Invitations that look like tickets to a game. Invitations that look like game-day programs. The program could include photos of all the players (in other words, the party guests) and short, funny descriptions of each kid. Invitations shaped like footballs. Cut a football shape from brown cardstock or construction paper. Sew the laces of a football through the paper using a needle and tan yarn or hemp string. Write the party information on the back. Pompom invitations. Make a mini pom-pom by cutting small strips of tissue paper and then binding the strips together at one end with double-stick tape. Wrap a small piece of construction paper around the tape to conceal it. Glue the base of the pom-pom to the front of a blank white card, and then write the party information inside. If you and your guests are die-hard fans of one of the teams playing in the Super Bowl, the party decorations are a no-brainer. Red cups, red streamers, red everything if red is your team's color. Blue plates, blue balloons, blue everything, if that's what your team wears. And so on through the rainbow. Your team might not have made it to the big game this year, though, in which case you'll want to divide the decorations so guests can choose a team to get behind. Set up a table where the kids can choose a balloon or banner in one color or the other. Gather up some old football helmets, place them upside down on the food table with a bowl inside each one, and then fill the bowls with chips or popcorn. If you can afford it, buy a faux-grass carpet remnant from a flooring store and lay it out in front of the TV for the kids to sit on during the game. It might be worth the money if you plan to host a Super Bowl party year after year, and you might find yourself using it again for birthday parties with a sporty or picnic theme (especially if those birthdays fall during wintertime). Hang a triangle pennant garland that spells out the words "Go Team!" behind the food table. To make one, cut at least seven triangles, spell out "go team!" with one letter on each triangle, punch one hole in two corners of each triangle, then thread a piece of yarn or ribbon through the holes. If you made extra triangles, string them on either side of the words to lengthen your banner. Set out plastic mini megaphones (compare prices) on the food table. Block off the narrow opening with a napkin and fill each megaphone with popcorn. Make signs for the kids to hold during the game, or have them create them themselves before the game starts. The signs could include the letter "D" and a picket fence ("defense! "), they could be triangular pennants on sticks with the teams' names on them, or they could be the children's own designs. Don't forget to decorate the kids! Set up a station where mini footballs can be painted on kids' faces (get parents' OK first, especially since some kids are allergic to face paint), set out party hats in the teams' colors or ask everyone to wear their team's colors to the party. Don't trust your artistic skills for face painting? Let the kids wear eye-black strips (compare prices) on their cheeks as the players do. Big-time football fans might never admit this, but let’s face it, the Super Bowl can drag on and on. Keep the kids engaged in the game with a little competition of their own called Super Bowl Smackdown. Print out copies of the Super Bowl Smackdown worksheet and have the kids fill it out before the game begins. It asks the kids to guess what will happen during the game, like what the final score will be and which team will win the coin toss. The party organizer can award small prizes after each answer is determined and then the child with the most correct answers at the end wins the grand prize, such as a football or tickets to see your team’s opening game next fall. First, you have to set up the table. Cover a long table with a tablecloth in your team’s colors or with a grass-green tablecloth you transform into a football field. Decorate with balloons and football-themed decor. You’ll want to serve snacks that are easy to eat and hearty, like mini sandwiches and dips. Seven-layer Mexican dips are always a hit. Spread a layer of guacamole across the top of the dip to mimic turf, then create the lines of the gridiron by placing sour cream in a plastic sandwich bag, poking a small hole in one corner of the bag and squeezing the sour cream onto the top of the guacamole. A couple of goal posts made from chopsticks or small dowels will drive home the theme. Another fun way to present Super Bowl food is to set out a basket full of small sandwiches wrapped in wax or parchment paper and tied with bakers' twine or string. Offer a few varieties, like Philly cheesesteaks or Reubens for the adults and older kids and peanut butter and jelly or turkey and cheese for the young kids. Pizza is another crowd favorite. You can make individual pizzas by cutting pre-made pizza dough into the shape of footballs, then topping each football crust with sauce and cheese. Or, make English muffin pizzas but cut the cheese in the shape of footballs. Of course, you can never go wrong with hot dogs. Serve them in concession stand-style containers to make the kids feel like they’re really at the game. When it comes to drinks, again think about what's easy to serve and tough to spill, like juice pouches or water bottles. For a cute touch, replace the water bottle labels with strips of paper in the teams' colors or black and white-striped paper to mimic referees standing stoically on the table. The kids can then write their names on the paper so everyone keeps their germs to themselves. It is flu season, you know. When you're planning your Super Bowl menu, don't just think about the ingredients you'll need. Give some thought to the containers that will hold the food. If your menu includes lots of hot items, like chili or meatballs, you might need to borrow or rent extra crock pots or warming chafers. The dinnerware you set out is also important. Offer bowls as well as plates, and, if you're going with disposables, don't use flimsy products. Since the game lasts all day, those plates and forks are going to get a workout. Make rice cereal-marshmallow treats shaped like footballs. Use frosting or small pieces of fruit leather to mimic the laces of a football on top. Bar cookies are easy to make, especially when you're serving a crowd. It's not like you'll have much trouble convincing kids to eat brownies, but Brownie Pops look downright irresistible. In fact, put just about anything on a stick (frozen bananas dipped in hardening chocolate, anyone?) and kids will devour it. If you enjoy cake decorating, make a football field cake or a cake shaped like a football. Many adults look forward to the Super Bowl halftime as much as (or more than) they anticipate the game. Why? The commercials are hilarious. But what's funny to adults often isn't appropriate for kids to watch. Your family might be completely comfortable with the content, and that's great. Have a laugh fest together. If you've squirmed a bit watching an ad for ED drugs next to your father-in-law, though, or you'd rather not explain the plot of the latest Go Daddy commercial to your 9-year-old son, avoid the whole situation by taking everyone outside for a game of backyard flag football. By halftime, everyone could probably use a little exercise anyway. You could even create large paper signs that each team has to bust through when they run onto the "field" (read: the backyard) at the start of the game. Here's an important tip, though. Make sure someone stays in the house with the TV on so they can call everyone back inside once the game starts up again. If it's too cold to head outdoors, rent a karaoke machine and stage your own halftime show in the living room. Super Bowl parties are fun and easy to throw, especially since the main entertainment is already provided, but they aren't foolproof. Be careful about how many people you invite to the party. If the group is too big, the noise level could climb, making it frustrating for football fans who want to focus on the game. Tempers can flare during a football game, too, especially when the score is close and guests have strong loyalties to the teams. 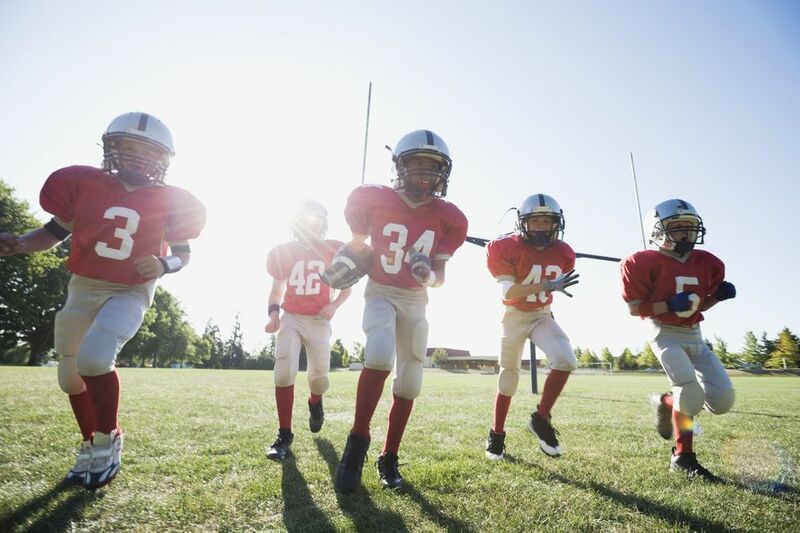 You might need to start the party with a pep talk about good sportsmanship and behavior expectations. And, by all means, when one of the other parents offers to contribute a plate of food for the party, accept it. Super Bowl Sunday isn't the day for cohesive menus with courses that "go" together. It's about sampling a bit of everything and suffering the consequences later. Yes, the kids might overindulge a bit, but they have a whole year to recover.